I have been living in Venice for two years and if there is something that I have learned during this period it’s that you can never say to fully know this city. If you only leave a known calle (Venetian term for “street”) for an unknown one, you will probably get lost and discover something new! That’s true for its architecture as well: If you abandon the traditional touristic routes, you can come across examples of modern architectonic elements, which are in a way unexpected in an historic city like Venice. Venice is famous all over the world for a very specific architectural identity, which differentiates it from the other cities and makes it absolutely unique. This identity, which constitutes the city’s heritage, is mainly made up of its sinking buildings as well as the grand structures built in a Gothic or Renaissance style. When you walk in the narrow alleys of Venice, you are immediately surrounded by an endless row of brick or stone buildings, which are very similar in terms of structure and in the shape of their doors and their street level windows. From this point of view, the architecture of Venice seems very uniform but there is no risk to get bored with the homogeneity of these structures because Venetian alleys are literally constellated of architectural wonders of deep historical importance. This city is an open-air museum with some of the most famous Italian architectural masterpieces, such as St Mark’s Basilica and the Doge’s Palace. Venice is generally known as the main expression of the Gothic style, which coexists with important examples of Renaissance and Baroque buildings. The expression “Venetian Gothic style” refers to the Venetian building style realized through the combination of the Gothic lancet arch with Ottoman and Byzantine elements. This style dates back to the 14th century and its main examples are the Doge’s Palace in St Mark’s Square and Ca’ D’Oro Palace. The phase of Gothic art in Venice was then followed by a period known as Renaissance, an era in which architects rediscovered Greek and Roman elements. These countless architectural wonders and the unique buildings of this “floating city” are the elements that attract millions of visitors every year. In this context, few people would imagine that Venice also hosts very important examples of modern architecture, which lay mainly undiscovered by tourists, hidden in the labyrinth of its alleys and canals. Many modern architects, including Carlo Scarpa, Santiago Calatrava, Cino Zucchi, have tried to leave their mark on this city. With this article, I want to start an imaginary trip, which will lead readers to discover the most important works of modern architecture in Venice. Our trip starts from Piazzale Roma, the transport hub at the entrance of the city, where there is the first and perhaps most controversial element of modernity, the “Constitution Bridge”. Also known as “Calatrava Bridge” from the name of its architect, it connects Piazzale Roma to “Santa Lucia” railway station. This bridge is completely different from the bridges Venice is famous for, since is mainly made up of steel and glass, with the “pietra d’Istria”, a stone typically used in Venice, as the only element of continuity with the other bridges. 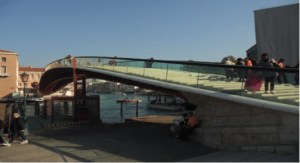 In my opinion, with its minimalist and modernist approach, this bridge does not fit exactly with its surroundings and with Venice decorative architecture. At the entrance of a fabulous city like Venice, this bridge does not embody the very nature and spirit of the city. 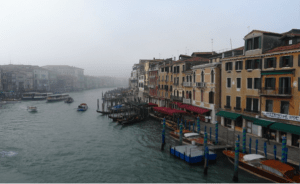 At the same time, it is not very functional since the glass steps become slippery when the weather is foggy, and this is very frequent in Venice. From Piazzale Roma, we get on a vaporetto and after a short ferry ride we are in Giudecca, where the main examples of modern architecture are concentrated. Giudecca was originally an area of large palaces surrounded by gardens, but at the beginning of the 20th century, the island turned into an industrial area. Much of the industry went into decline after World War II, and most of the industrial buildings were reconverted in residential ones. In fact, nowadays, Giudecca is a quiet residential area of mostly working-class housing with some chic apartments and exclusive houses. An example of this conversion is the Molino Stucky, a neo-gothic building originally born as a mill and now turned into a five star Hilton hotel. 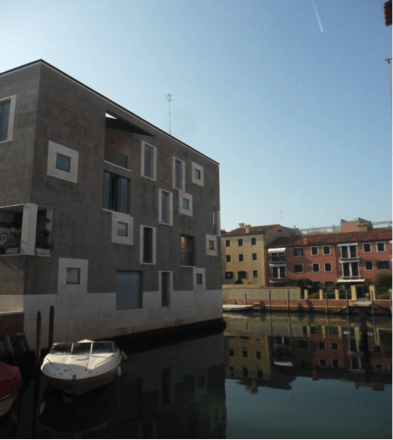 At a first sight, the buildings in this area are so not different from the others in Venice but taking a walk into its southern part, a visitor will be struck by a completely different area, with unusual modern buildings. The area I am talking about is known as Junghans, from the name of the Dutch watch firm that opened there in 1877. After the failure and the closure of this firm in 1971, the area was abandoned until the early 2000’s when the industrial buildings were replaced by a theatre and residential buildings. The picture above is in my opinion very explicative of the architectural nature of Giudecca, with modern residential buildings facing the historical ones, without clashing. 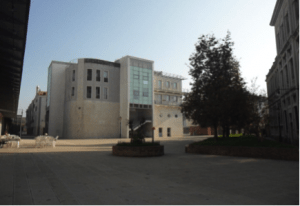 The project of urban renewal was realized by the Italian architect, Cino Zucchi, who is famous for his ability to requalify industrial and historical areas. Using Venetian traditional construction buildings, this architect was able to introduce in Giudecca modern architectural elements, such as the irregular disposition of the windows and balconies, realizing buildings that due to their simplicity fit perfectly, in my opinion, with the traditional urban environment of the city. From this point of view, Giudecca is the proof that history and modernity can perfectly co-exist even in a traditional urban fabric like the one existing in Venice. This demonstrates that in this city there is space for modern elements, as long as architects show sensitivity to existing structures and uses elements of continuity with the tradition. Besides preserving the inestimable cultural heritage, Venice, in my opinion, should look forward, giving a chance to contemporary architects as well, whose work will possibly represent an additional heritage for future generations.